Fall here in Vancouver usually means the return of the rain. In the gloomy weather, it can be easy to miss the beauty of this changing season. 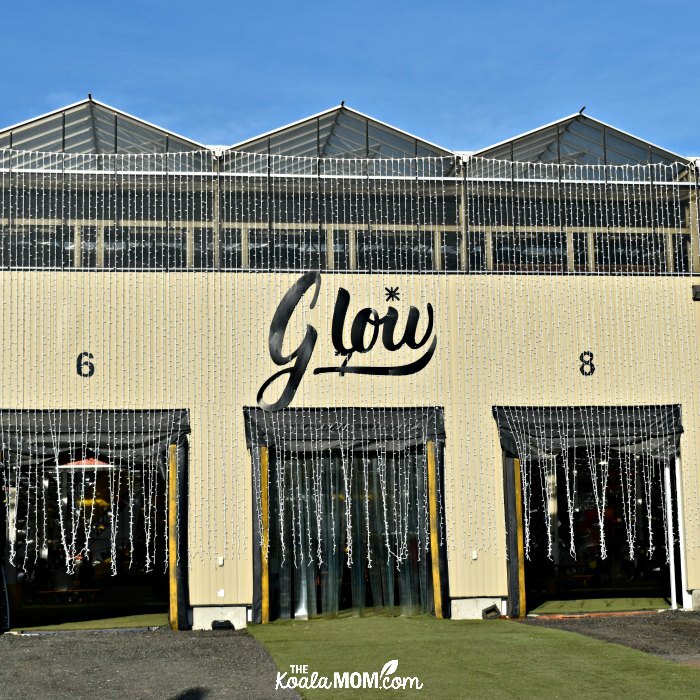 Celebrate all the best of these months by visiting Harvest Glow in Langley. 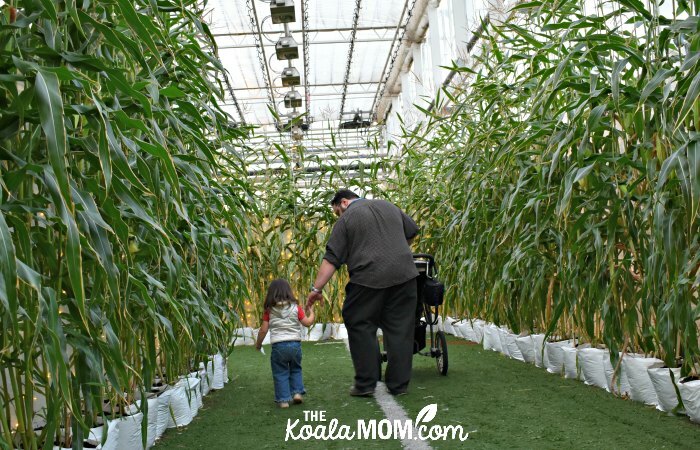 With a pumpkin patch, corn maze, petting zoo, playgrounds and more, this harvest festival is fun for the whole family! Plus, it’s indoors, so you can play without worrying about the rain! My family received complimentary media passes to attend the opening night of Harvest Glow. All opinions expressed are my own. 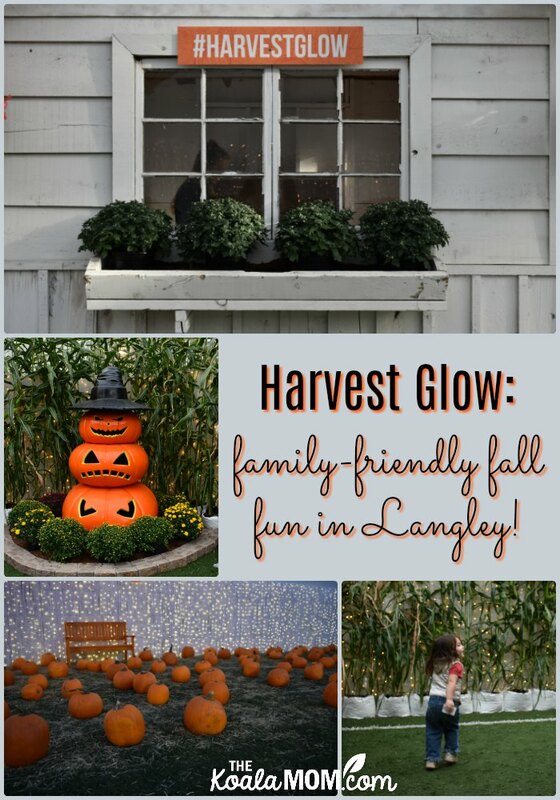 Harvest Glow is located in Langley, just off Highway 1 and Highway 10. 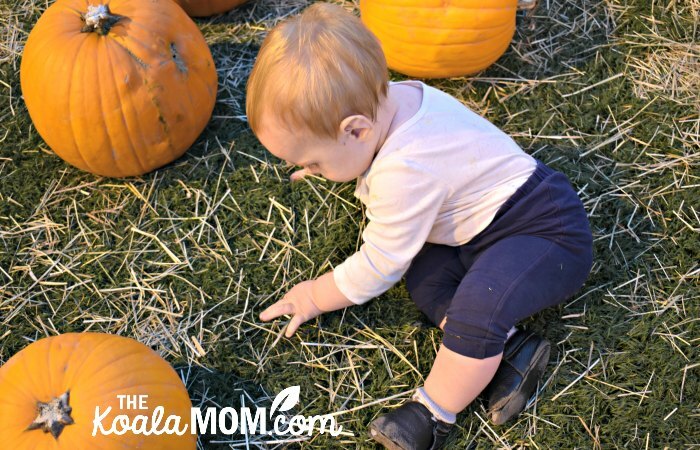 When I heard pumpkin patch and corn maze, I thought we’d be wandering around fields outside. I had the girls wear their hoodies and running shoes. I needn’t have worried! 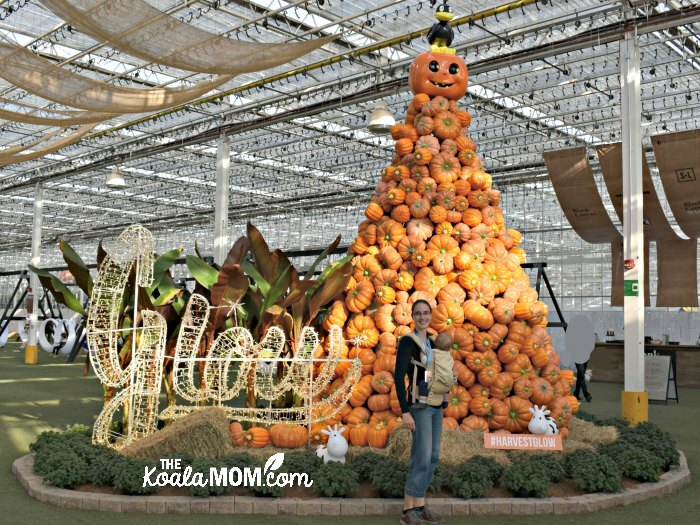 Harvest Glow is located inside a huge greenhouse. The weather inside is perfect and the grass never gets muddy! 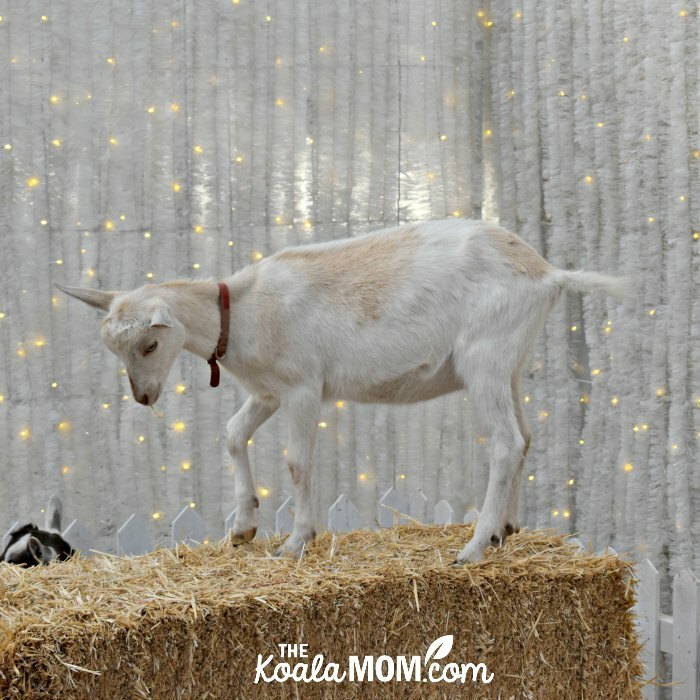 If you’re looking for fall family photos, Harvest Glow is the perfect location! I took my Nikon DSLR and attempted to get the girls into semi-matching outfits (we went with jeans and black tops). From the front gates, we were greeted with tons of fall decor and photo opportunities. 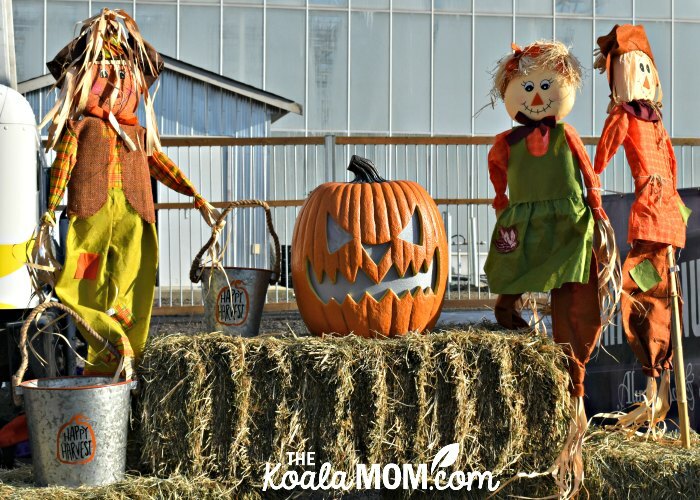 The girls had fun posing with scarecrows and jack-o-lanterns, pumpkins and bumblees, glowing lights and more. 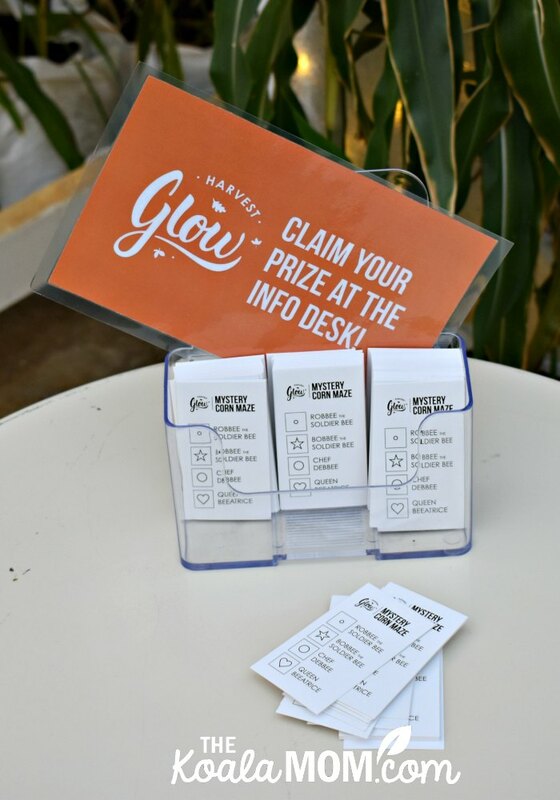 Scroll #glowlangley on Instagram for tons of photo ideas! You’ll want to have your kids in hand when you walk in the door, because everything looks so amazing and exciting. If your kids are anything like mine, they’ll take off in all directions. Thankfully, I had Joey strapped to me and Pearl was sleeping in the stroller, so we just had to chase the older three. And they headed for the LED swings. 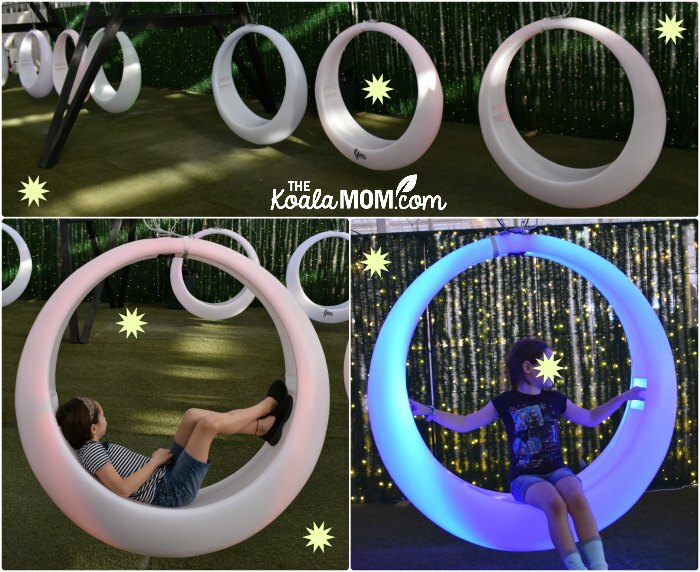 I mean, they are the coolest swings you’ve ever seen! I saw plenty of adults trying them out (including my hubby!). As we were driving out, my husband asked why it was called Harvest Glow. He thought “glow” was better suited to Christmas, but who says twinkly lights can only be put up in December? 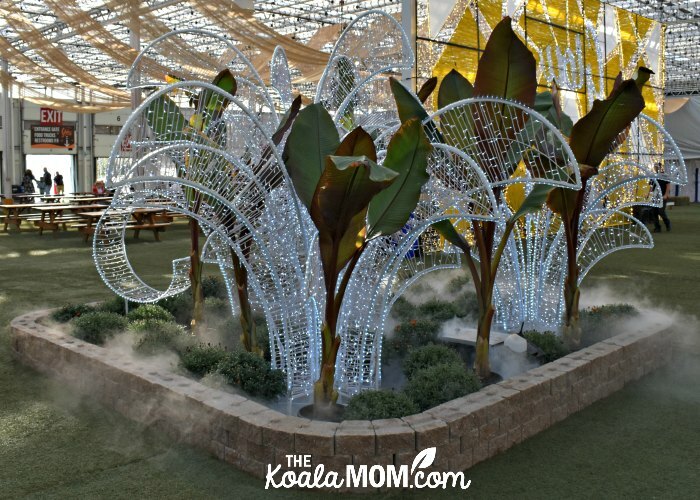 Harvest Glow shows just how much fun fancy lights are at any time of the year! From the strings of lights all around the venue, to the twinkling decor, to the glow-in-the-dark hopscotch, there’s so much glowing on! It’ll all leave a glow on your face too. From the swings, we headed over to play a round of mini-golf. Brightly coloured balls and kid-sized clubs were provided in the clubhouse in the middle of the course. There were four colours of balls, but Jade opted to be score-keeper. I took pictures and pushed a still-sleeping Pearl around in her stroller. 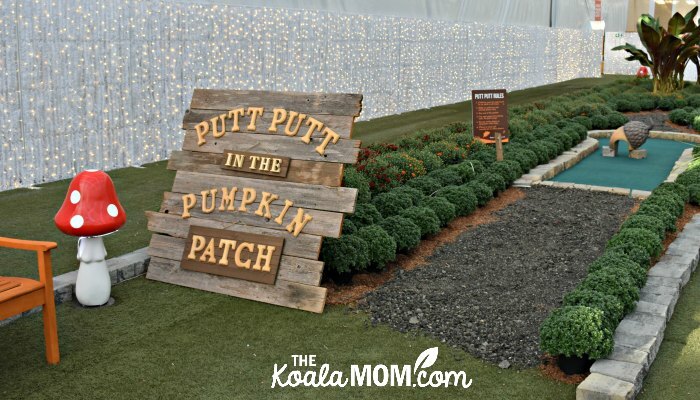 The putt-putt course was adorable, lined with beautiful plants and circling the golf hut. My husband attempted to coach the girls in the proper methods of holding their club and not nudging the ball towards the hole, but we also tried to play quickly as other families wanted the course. 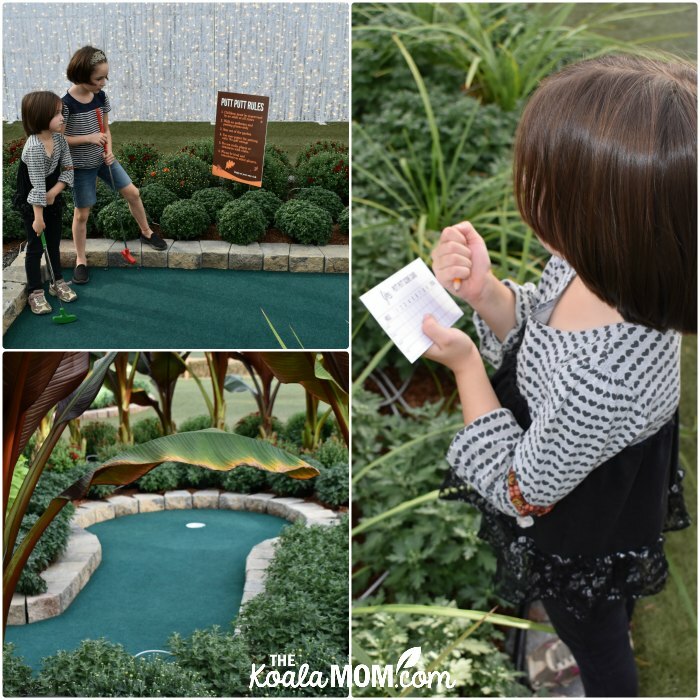 I’m not sure who won the mini-golf game, but they all had fun! At the back of the hall was the Petting Zoo, with bunnies, goats, lambs, and pigs. Pony rides were also available by donation. Sunshine wanted to do the pony ride, but at that point, her sisters were going all directions. Pearl had woken up and caught sight of the playgrounds, and Joey was done with riding in the Ergo while everyone else got to play. The Glow-comotive tours around the outside of the putt-putt course. It runs on wheels rather than rails. There are four little cars, which are actually bigger than they look. Our family could’ve probably fit into one car, but we split into two groups for the ride. The girls had fun watching the lights and scenery go past outside their windows. Even Joey thought it was fun! The market features local vendors selling a variety of products, including kids’ books, organic honey, and Norwex. My husband browsed there quickly while I supervised the girls bouncing. 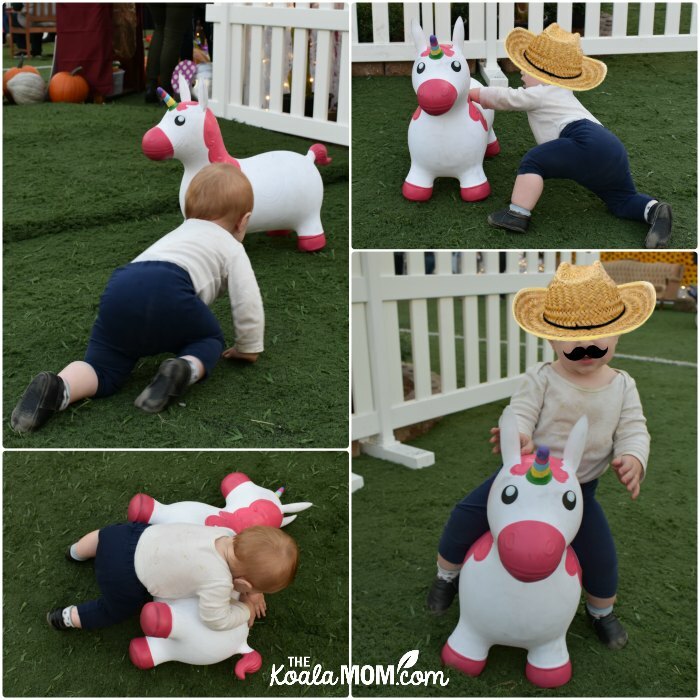 Because would you rather shop or bounce on cute cows and unicorns? 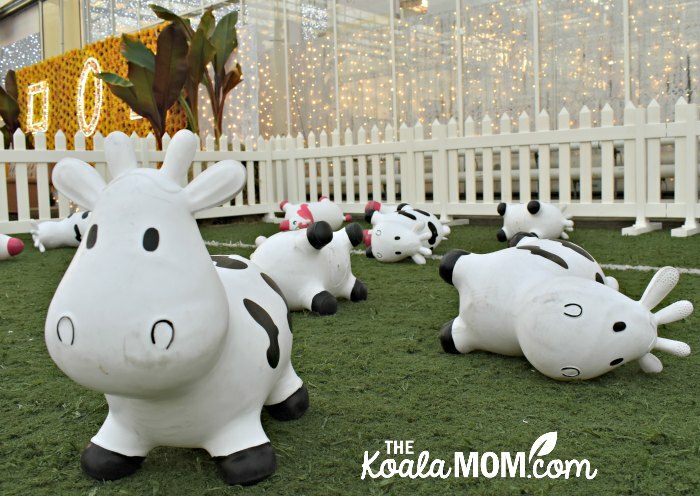 What would a harvest festival be without a few cows? Even Joey got into the wrangling. When we convinced the girls to stop bouncing, we watched some pumpkins telling jokes and stories. Then the girls ran walked through the corn maze. It wasn’t a very complicated corn maze, but Sunshine and Lily thought it was supposed to be easy so it was good for kids Pearl’s age. At the start of the maze, the girls each grabbed a scavenger hunt card. There were four bees “hiding” in the corn maze (along with a few snails, giant corn, and pumpkins as well). They had fun punching their cards when they found each of the bees in the maze. Jade and Pearl needed a bit of help with the punches, but the older girls were able to do theirs. They also enjoyed posing with the bees. Then they turned in their cards to claim a candy. Nothing says “fall” and “harvest” like a field full of round, orange pumpkins. 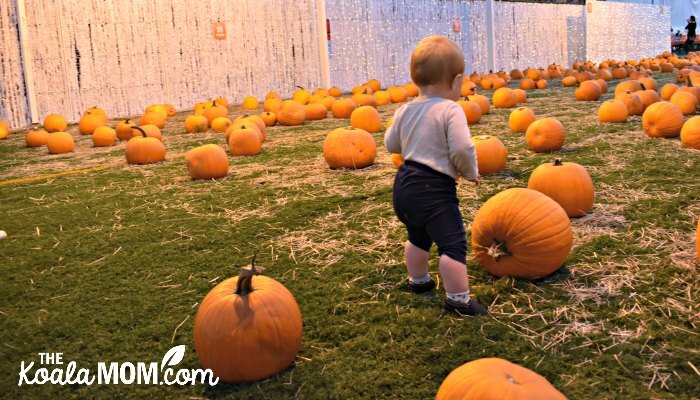 And if pumpkin picking makes you think of muddy fields and rotten pumpkins, you need to visit the pumpkin patch at Harvest Glow. Clean pumpkins lay scattered around the grass, ready for carving or just taking pictures. I did attempt to round up the girls for a group picture in the pumpkin patch. By that point, Joey was done with pumpkins and didn’t want to join in. If you are hoping for pictures with the pumpkins, I’d suggest going here first. Shoot your photos while everyone is happy and less tired, and then let them go play. As you can see, there’s so much for everyone here! We easily spent three hours there and only left because we had another commitment that evening. It would have been easy to let the kids play longer in each space. 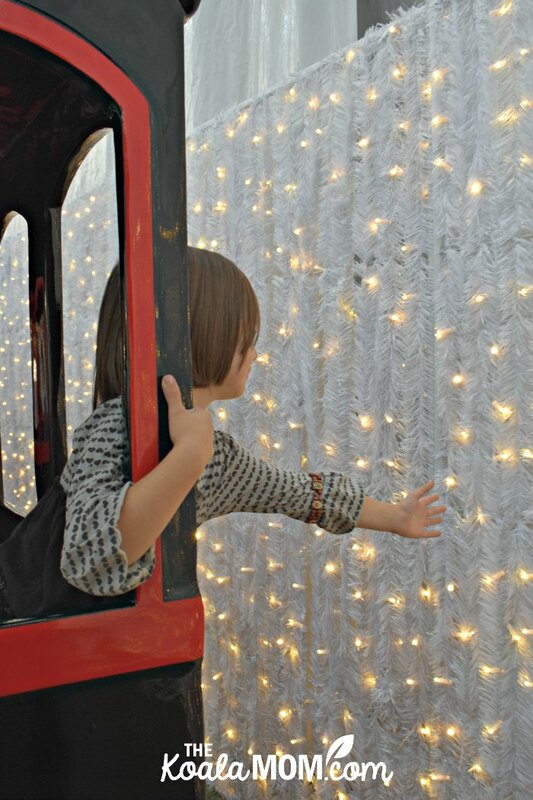 If you’re looking for a family-friendly fall outing, check out Harvest Glow. It runs until October 31st but some dates are already sold out. You can get all the details about visiting (and buy your tickets) on their website. Cost: family admission is $39.95 for two adults and three kids. Children under three are free. Face painting was available near the putt-putt course, for $7-9 per design. Pumpkins cost $5 each. There were carving stations right next to the pumpkin patch, with orange plastic table cloths, carving tools, and a bucket for the waste. If you do want to carve pumpkins, this would be a great way to keep the mess out of the house! There were bars located throughout the hall, as well as a coffee shop. Juice cost $3.50, a pumpkin spice latte ran about $5 and wine was $7. I’d recommend bringing a water bottle with you, as water wasn’t available. We had my 1-litre bottle with us, but with all the fun, it was soon gone. The girls were begging for more water and I was surprised that there wasn’t a water bottle refilling station. There were also food trucks outside the hall with more snacks if you arrive hungry. Mini donuts are one of our favourites, but there was also mac-and-cheese. 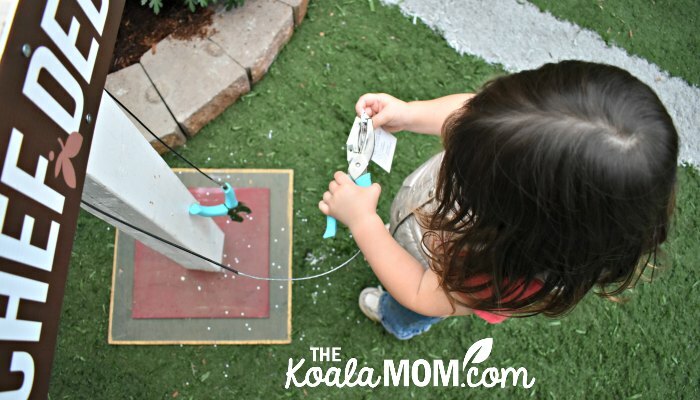 Kid-friendly: absolutely! I saw two friends there on a date night but I’d say this is more of a family place. All the girls enjoyed the activities here. As our kids now range from 1o to 1, it can be hard to find activities that keep everyone happy. Harvest Glow did! Baby-friendly: yes! We had our jogging stroller with us and there was plenty of room to navigate it, with no stairs and only a few small ramps. There’s a baby change table located in both the men’s and women’s washrooms.